I approach all self help-type books in much the same way-with an air of suspicion and trepidation. I was forced to reconsider that attitude when I flipped through Girl, Wash Your Face and the first words I read were “THE LIE: You Are Going to Marry Matt Damon.” Now that got my attention. What followed was a couple days of internal struggle of should I/shouldn't I read this book. Let me save you the trouble. Just do it! 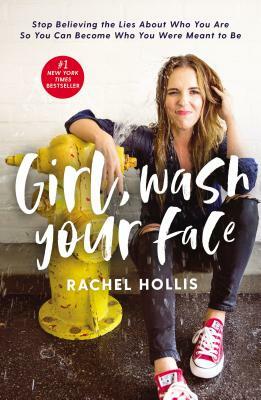 Rachel Hollis approaches the troubles of women in every stage of life with candor and humor, even when the topic at hand is a rough one. She writes with a voice that is readable and clear, honest, but not harsh. From relationship woes to career hardships, Rachel has a story for you. I gleaned wisdom even from the stories that didn’t pertain to me, like the ones on marriage and motherhood. The best part is that once the book is done, your interactions with Rachel don’t have to be. She is a media mogul in charge of her own lifestyle website, thechicsite.com, and the host of RISE Podcast, which tackles career and lifestyle advice. She also hosts, with her husband, the RISE TOGETHER Podcast, which covers relationships and parenting. I can’t say enough nice things about this book. I look forward to her next, Girl, Stop Apologizing, which is available in March. If you enjoy this, consider HARLEY AND ME by Bernadette Murphy. ALSO AVAILABLE AS AN AUDIOBOOK.